Back in 2006 I received an email from Norman Lebrecht inviting me to share with him some inside stories from my time at EMI, and Norman also asked me to pass the message on to a very good friend who held a key position during EMI's 'Indian summer' of classical recording. At the time Norman was researching his controversial book, 'Maestros, Masterpieces & Madness: The Secret Life and Shameful Death of the Classical Record Industry', and knowing this we decided not to take up his invitation. But some colleagues who had a part in the madness decided to tell all, while others, including my boss at EMI, Peter Andry, chose to publish their own versions of events. Peter Andry was educated in Australia before joining Decca in England in 1954. He moved to EMI as a producer in 1957 working for David Bicknell who ran HMV while Walter Legge was still managing the Columbia label. Following Legge's departure in 1964 Andry took over the management of all EMI's activities under what was to become the International Classical Division (ICD), a position he held until 1988 when he became president of the newly formed Warner Classics until retiring in 1996. The artists who worked for EMI during Andry's years with the company comprise a role-call of the famous names of classical recording. 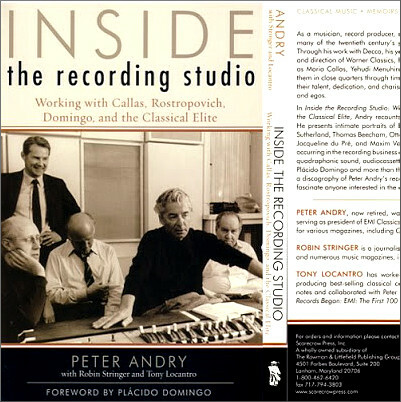 Karajan, Callas, Rostropovich, Domingo, Beecham, Muti, Previn, Giulini, du Pré and Klemperer are just some of the greats who appear in the pages of the newly published Inside the Recording Studio. The sub-title is 'Working with the classical elite' and during Andry's tenure many classics of the gramophone appeared on the HMV label, including Karajan's Dresden Die Meistersinger von Nürnberg and the Beethoven Triple Concerto recorded in Berlin with Oistrakh, Richter and Rostropovich. A session photograph from the latter recording is on the cover of the book which is seen above, Peter Andry is standing at the back. I should make my personal involvement clear at this point. In the mid-1970s, in response to the increasing globalisation of the record industry, Peter Andry was sent by EMI on a marketing course at INSEAD, the prestigous French business school. As a result of this course he decided to recruit an International Marketing Manager who would combine marketing experience with the ability to differentiate Boyce from Boulez, although as it turned out neither composer featured prominently in his recording plans. The marketing guru recruited into EMI was me, and although I worked for Andry for a relatively short period of time I was able to observe the maestros, myths and madness as an inmate of the asylum. Many fine people contributed to the achievements of EMI's International Classical Division, but I was not one of them. My main achievement during my time there was to learn that banging your head repeatedly against a brick wall hurts no one except yourself. 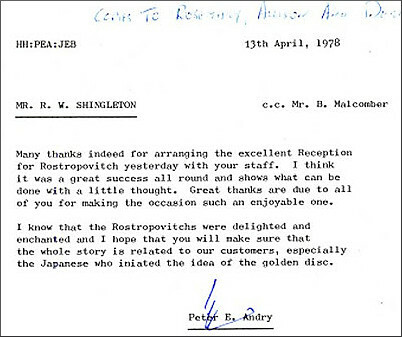 But at least I was privileged to meet some remarkable musicians, as this memo shows. Inside the Recording Studio is a strange book. The slim, but well illustrated, £30 ($45US) paperback comes from a small American publisher. It was written by Peter Andry together with EMI historian Tony Locantro and journalist Robin Stringer, although the contributions of the other two authors is not made clear. There is a selective discography of recordings made under the author's management. But the discography does not tell you who was actually inside the recording studio; although session dates and venues are given the producer is not identified, unless it is Peter Andry. And, I'm afraid, the narrative style is wooden; Norman Lebrecht may sometimes miss his target but he can certainly write superbly readable prose. The locations of the stories may help to explain the subsequent financial problems of both EMI and Warner Classics - 'On a trip to Barbados, where we used to go for international meetings, I was coming up from the beach late one afternoon with my colleagues ... I saw a large figure with two ladies on either side: it was Pavarotti relaxing against the wall of the Sandy Lane Hotel'. But Peter never was one to hide his light under a bushel, and he is happy to share with us how 'In the autumn of 1968 I was dispatched to repair EMI's failing fortunes in the United States'. There is much for the serious record buyer to savour Inside the Recording Studio, but there is also much misssing. Peter Andry portrays himself as king of classical recording at EMI and clear successor to the despotic Walter Legge, but we should remember that it is the court that makes the king. The book focuses very much on the king at the expense of his court and its intrigues, despite the fact that the court had an important influence on what actually happened inside the recording studio. In an attempt to curb Legge's wilder excesses EMI's senior management created the International Classical Recording Committee (ICRC). The ICRC comprised representatives of all EMI's local operating companies, and the staff producers proposed recordings to the committee. The local companies then gave sales estimates which were used to determine the financial viability of the proposals; not enough forecast sales meant no recording. This bureaucratic and byzantine process continued after Legge's departure. But the ICRC does not receive a single mention in the book, even though it, in theory, decided what was actually recorded. I attended ICRC meetings as an observer and was able to see the frequent conflict in priorities between the large-budget Karajan operatic spectaculars backed by Andry and the equally deserving but lower profile proposals from other producers, such as Previn's 1977 Turangalila Symphony. One of EMI's more notorious projects also fails to merit a mention. 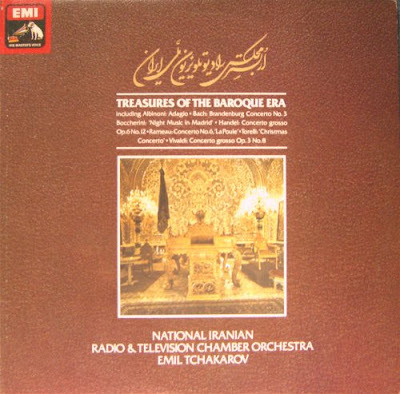 In 1978 a recording with the unknown and inaccessible National Iranian Radio & Television Orchestra, featuring Albinoni's misattributed Adagio and other distinctly Western music was fast-tracked through the ICRC. Quite why we never knew, but attempts to specify real gold-foil on the sleeve of Treasures of the Baroque Era,which is seen above, were, thankfully, rejected. Subsequently rumours circulated that the EMI producer and engineer both received a Rolex Oyster from a member of the Shah's entourage when the sessions were finished. A wag suggested the LPs should have been titled In A Persian Market, but that title had already been used. Sadly this Iranian story does not have a happy ending. The year after the recording was released the Iranian monarchy was overthrown in a revolution. Hardly surprisingly, the incoming Ayatollah Khomeini did not green-light Treasures of the Baroque Era Volume 2 and EMI's Iranian ambitions became an e-Bay oddity. 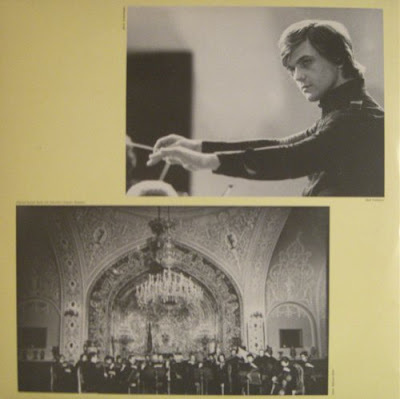 The talented young conductor of the double-LP set was Emil Tchakarov, who was one of the prize winners of the 1971 Karajan International Conducting Competition in Berlin, a contest whose judges included Peter Andry for eight years. Tchakarov died at the tragically young age of 41 in 1991 leaving a small recorded legacy. The inside of the gate-fold sleeve for the LPs produced by the art department under my control is shown below. The photos are of Tchakarov and the Iranian orchestra in front of the Peacock Throne in the Golestan Palace in Tehran. As well as omitting the story of the ICRC, Inside the Recording Studio also positions the local EMI companies as mere outposts of the Andry empire. In fact these companies delivered important locally funded recording projects which bypassed the ICRC approval process. Among these were Sir Adrian Boult's Vaughan Williams and Elgar cycles, and David Munrow's pioneering records, all from EMI Records in the UK, and the magnificent Reflexe early music series from EMI Electrola in Germany whose discoveries included a young Jordi Savall. Early and contemporary music were not high on the agenda of Andry's International Classical Division, and it was left to the local companies to take the initiative in these growing market segments. Technology also receives short shrift in the book. 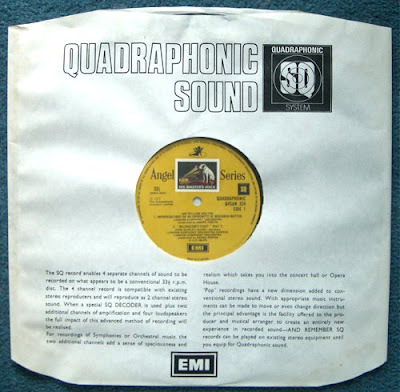 There in no coverage of EMI's ill-conceived flirtation with the SQ quadraphonic sound format in the early 1970s (see below) which was forced through against the wishes of the recording producers, and the book contains not a single mention of MP3 or other download technologies, despite a promise on the jacket to do so. 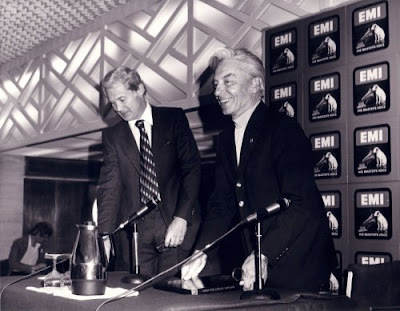 There is much reminiscing over the great days of Callas and Karajan but no mention of the carnage that followed at Decca, Warner and EMI as the twenty-first century arrived. The gossip around Karajan's table at the Tessinerstuben in Berlin was so absorbing that no one saw the coming twilight of the gods. There is not a single mention of the new independent labels such as Naxos and Hyperion who chose economy instead of business class and thrived as EMI and Warner floundered. But a full chapter is devoted to the Testament label who recently re-issued the 1955 stereo Bayreuth Ring conducted by Joseph Keilberth with Hans Hotter, Astrid Varnay and Wolfgang Windgassen, a recording originally produced for Decca by Peter Andry. Much else has been left out including the regular leaks, allegedly from a staff member, to the satirical magazine Private Eye's Lunchtime O'Boulez column. There is one other story that didn't make it Inside the Recording Studio, and I end with it simply to show that there was more to life with Peter Andry than networking on the beach in Barbados. In 1978 I travelled to Mexico City with Peter to work on the project that resulted in the Music of Mexico recordings that I wrote about in 2007. I had travelled alone from London to the East Coast where I attended Riccardo Muti's first EMI sessions with the Philadelphia Orchestra. Next stop was Los Angeles where I heard Carlo Maria Giulini conduct the LA Philharmonic in the Dorothy Chandler Pavillion. Peter Andry then arrived in LA and we flew together to Mexico where we spent a week with the local company. As I had been away from home for some time I had accumulated a fair amount of dirty laundry which I was not prepared to take home to my long-suffering wife. Peter and I were both were staying in the Camino Royale in Mexico City, one of many hotels hastily built for the 1968 Olympics. Room service was terrible, and only after repeated requests was my laundry finally collected. Peter Andry and I were checking out at different times. I was returning direct to London, he was going back to the States. Hours before I was due to leave my laundry still had not been returned. After several angry phone-calls a pile of freshly-washed clothes was delivered to my room minutes before I left. My own laundry was all there, but so was a considerable mount of underwear that was not mine (bright blue is not my colour). In desperation I threw the surplus briefs in the garbage bin and dashed to pay my bill. When we both finally returned to London I happened to say to Peter that the hotel in Mexico City was a bit strange. 'Yes, it was rather,' he replied 'Do you know they lost all my underwear'. Photo above shows Peter Andry with Herbert von Karajan and is from another tale of Maestros, Myths & Madness. Great stories, and the blue underwear at the Distrito Federal Camino Royale was too good.